Duodenal Switch is a surgical technique for weight reduction and comorbid diseases control; It is the most laborious of all bariatric procedures so far, it involves performing a Vertical Sleeve Gastrectomy and a Y-Roux Bypass to the duodenum. With this technique, a 70% of excess weight is lost in a long term, improving all comorbidities and reaching a 95% to 97.9% metabolic regulation of dyslipidemia and diabetes. 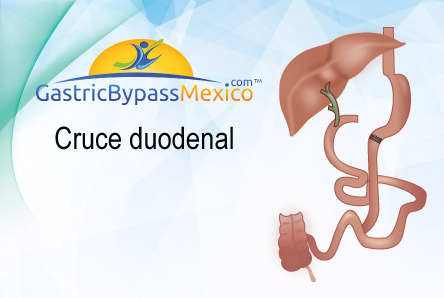 Notorious changes can be seen since the first week of a Bariatric Surgery of Duodenal Switch. This surgery, which must also be done through minimal invasion, requires five to seven incisions, so six are usually done. How does the patient benefit from a Duodenal Switch? 1.- Restrictive component: reduction of gastric capacity by 75%. 2.- Malabsorptive: the exclusion of the duodenum and the proximal jejunum from the transit of nutrients prevents the secretion of a signal that promotes insulin resistance that leads to a Type 2 Diabetes Mellitus. It stops absorbing a significant amount of fat. When presented, these are correlated to the BMI of each patient, being up to 24% in patients with a BMI greater than 50 and 14% in patients with a BMI lower than 50. Whether they are early or late complications, most of them are metabolic in nature and easily controlled, achieving a good satisfaction index, with a mortality rate not higher than 1.5%. - The derivatives of nutritional malabsorption. The oral intake begins 24 hours postoperatively, if there was no evidence of leakage in the study of contrast medium. The diet is similar to a Gastric Sleeve or Gastric Bypass regimen: four stages for six weeks, with a progressive volume from 30 cc to reach 150 cc, without changing the quality of the food. The patient will start with clear non-caloric drinks, decaffeinated and non-carbonated liquids (three days). Progressing to full liquids for 14 days. This diet contains high biological value proteins (25-30 gr.). The third phase contains soft foods or purees (crushed food) for the following three weeks: 90 cc to 120 cc, five to seven times a day and a protein goal of 60 grams. And the last stage is conformed with three small meals and two or three snacks; solids, fats and low sugars are prohibited. The following nutritional supplements should be taken: iron 300 mg, calcium 500 mg, vitamin D 50,000 Ud, vitamin A 20,000 Ud and a multivitamin daily. - Calcium metabolism: calcium, vitamin D, and PTH. - Hematological evaluation: hemoglobin, serum iron, ferritin, folic acid, vitamin B12. - Liver function: ALT, AST, alkaline phosphatases and bilirubin. - Liposoluble vitamins: A, E and K.
95% of the patients who underwent Duodenal Switch surgery feel very satisfied, since they significantly improve activities of their daily life such as: personal acceptance in their social life, personal hygiene, walking, climbing stairs, self-confidence, marital and sexual relationship, as well as a very remarkable improvement in areas such as a change of appetite, vomiting, abdominal problems, the type and characteristics of the stools. The Duodenal Switch is not reversible, since it permanently changes the size of the stomach and approximately 85% of it is eliminated. This procedure has been done for more than seven years, with an increasing trend towards laparoscopic operations instead of open surgery. It is not advisable to consume alcohol during the first six to eight weeks after the surgery. Keep in mind that a Duodenal Switch surgery causes alcohol to be absorbed faster and patients often feel intoxicated quicker, even with smaller amounts. If the Duodenal Switch is performed laparoscopically the scar will be minimum. In Laparoscopic surgery, a long incision is not performed. Instead, the Surgeon makes five small incisions through the upper abdomen and these are closed, either with surgical glue or soluble staples. Scars are usually healed in two or three weeks, and their appearance fade away with time. Most patients experience a dramatic appetite reduction after having a Duodenal Switch surgery. It is recommended that patients follow a healthy diet to minimize any cravings, along with cutting back on unhealthy foods. The mortality rate of Duodenal Switch surgery is of 0.76% for open surgery and more than 1% for laparoscopic surgery. Patients who undergo a Duodenal Switch surgery should follow a puree and liquid diet for about a month. As soon as the patient can tolerate food without vomiting, other milder foods followed by solid foods will be included. Most patients should stay for 1 or 2 nights at the hospital. In some cases, if the stay is longer, the Doctor will properly inform. The Duodenal Switch is generally a surgery with which a rapid weight loss is achieved. However, this type of procedure has significant health risks and is not suitable for all patients. HOW MUCH WEIGHT WILL I LOSE WITH A GASTRIC BYPASS SURGERY? A patient can lose up to 60% of their excess weight during the first year after the procedure, and between 75% and 80% the following 5 years.